Boasting delicious gourmet pizza, pasta & sides, along with plenty of parking and reasonable prices. We are a BYO pizzeria restaurant with no corkage fee, Our vision for Claremont Pizza, is a local, community focused pizzeria where guests can enjoy a casual dining experience with a relaxed atmosphere. Order online for pick up or delivery. Delivery also available via UberEATS. 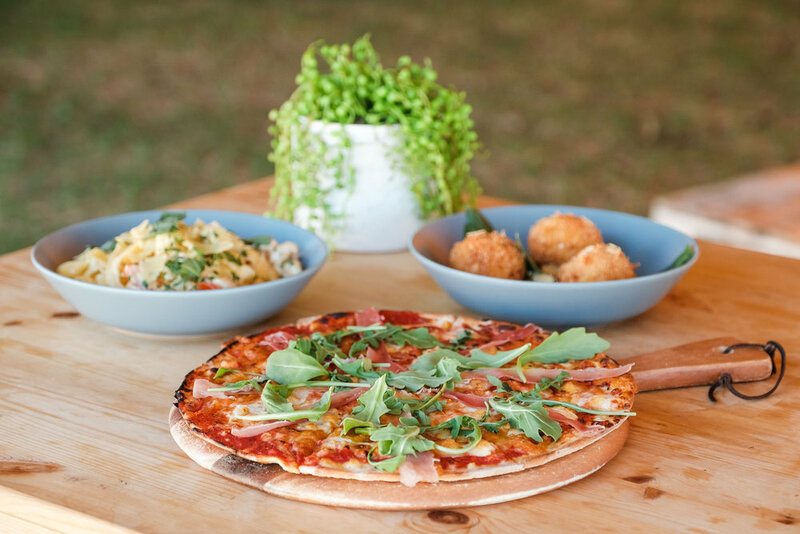 Our guests have the option to dine-in under our GIANT TIPIS set up on the grassed area in front of the pizzeria. Relax and enjoy your pizza with a bottle of BYO wine under the stars on your picnic rugs. Or bring the kids and let them play while you chill out. Check in here for regular tipi updates. Our tipis are currently up until 13 May 2019. Mushroom, asparagus, garlic, feta, creamy base, parmesan, parsley, fresh rocket. Grilled eggplant, marinated artichoke, baby spinach, roasted capsicum, mushroom, sundried tomato, Napoli Base, mozzarella, fresh rocket. Contact us by via orders@claremontpizza.com.au or via the online form below. Reservations and walk-ins welcome. BYO licensed restaurant. No alcohol sold on site. Ordered Claremont Pizza for the first time the other night – Just wanted to let you know we were really impressed. The pizza toppings were really fresh and the base was tasty. Also your New York Chicken pasta was so good! We live handy and thought we would try the newly opened Claremont Pizza. We ordered one of the pizza combos and picked it up from your kitchen. I was surprised to learn you are located inside the Claremont Showgrounds, but was actually great to access easy parking inside. Can’t wait to come back with a bottle of wine when you set up the giant Tipis on the lawn. Think we have found our new local.